379 were read, and meditation and poems presented from our temperance papers. Eloise Keister presided and led in the pledges to the flags. Mrs. Allen gave her reports from the State Convention which she had attended as a delegate. Eloise Keister presented lessons from the study book - "Mind if I Smoke?" She told us what is in cigarette smoke, stressing the tar and nicotine content. We were informed of attempts to make "safe cigarettes" by decreasing the tar the nicotine contents and by use of "filter tips." During the business session, minutes of last two meetings were read and approved. A letter of appeal from Sam Morris was reviewed by Nellie Lincoln, and the members present voted to send $5.00 to help him with the new radio station KDRY in San Antonio, Texas No meeting Dec. 1963. The W.C.U. met on Jan. 21, 1964 with Mrs. George German, Eloise Keister presiding in the absence of the Co-Presidents. 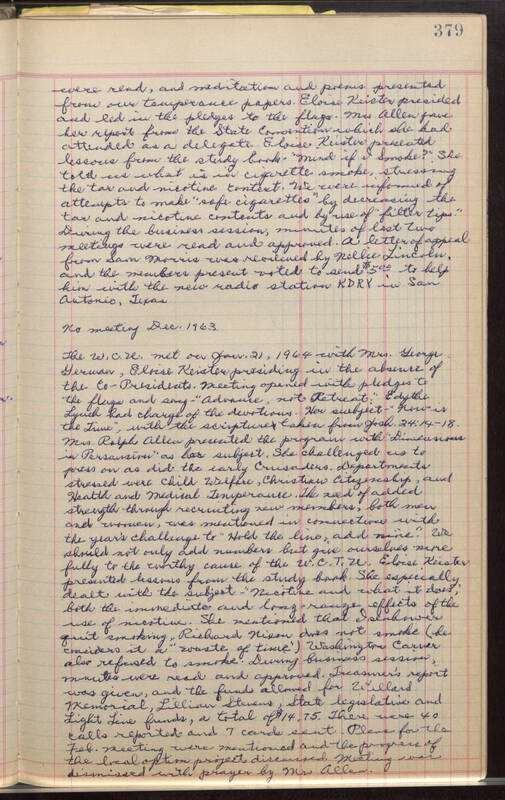 Meeting opened with pledges to the flags and say - "Advance, not Retreat:" Edythe Lynch had charge of the devotions. Her subject - "Now is the Time", with the scripture taken from Josh. 24:14-18. Mrs. Ralph Allen presented the program with "Dimensions in Persuasion" as her subject. She challenged us to press on as did the early Crusaders. Departments stressed were child Welfare, Christian Citizenship, and Health and Medical Temperance. The need of added strength through recruiting new members, both men and women, was mentioned in connection with the year's challenge to "Hold the line, add nine." We should not only add numbers but give ourselves more fully to the worthy cause of the W.C.T.U. Eloise Keister presented lessons from the study book. She especially dealt with the subject - "Nicotine and what it does" both the immediate and long-range effects of the use of nicotine. She mentioned that Isenhower quit smoking, Richard Nixon does not smoke (he considers it a "waste of time") Washington Carver also refused to smoke. During business session, minutes were read and approved. Treasurer's report was given, and the funds allowed for Willard Memorial, Lillian Stevens, State legislative and Light Line funds, a total of $14,75. There were 40 calls reported and 7 cards sent. Plans for the Feb. meeting were mentioned and the progress of the local option project discussed. Meeting was dismissed with prayer by Mrs Allen.